And be better off than you are..
Or would you rather be a mule..
1. Once more, making lists for a going away. This time where maybe no wifi, no cell coverage so have to take 365 the best way I can. 2. A family gathering but ex-wife and partner, odd grandchildren are also invited! I’m very good at smiling. 3. In charge of the TV remote and swiped from one channel to another! Thanks for making a great start to my day - singing along as I type. Love those moonbeams. You are off jaunting again? I can't wait until it is our turn to trip around. Good luck with #2 although as you say - you are great at smiling, and making others smile. @kiwinanna Just up to Christchurch for the gathering but then on to a place called Orton Bradley Park in Charteris Bay. No wifi but rare trees and rhododendrons, picnic places, bike trails (I'm taking my bike) and a cafe! We all have these trials to get through occasionally...will be lots better than you imagine...a smile helps everything! Love those cheery silly words, I can hear them now, always bring smiles to faces & more memorable than the modern stuff! Love your jar! Looking forward to your travels myself...does it involve planes as you are coming into winter? @happypat No planes, no trains, Pat - just as I noted to @kiwinanna above. Its Easter this weekend and we are going early and coming back late to miss the traffic! Delightful jar of moonbeams! I could use some of them! @olivetreeann Maybe there is a bit of magic in them, Ann! Love your moonbeams, and yes I know that song well. You put a smile on my face Maggie as I am getting ready to go to bed - Love that old nonsense song and it shall be going round in my head as I fall asleep !! Have a nice trip and make sure you have all the essentials with you !! @bery Like chocolate and whisky, Beryl? Wonderful, colorful image...I keep singing that song :). "Glitteringly" beautiful & I will be singing that song all day, I remember singing it with my children. Enjoy planning your next trip. Brilliant capture of these movies! Still love this song too. Love this image. Keep smiling, Maggie! As long as the smile reaches my eyes, Lou Ann - I will be OK! 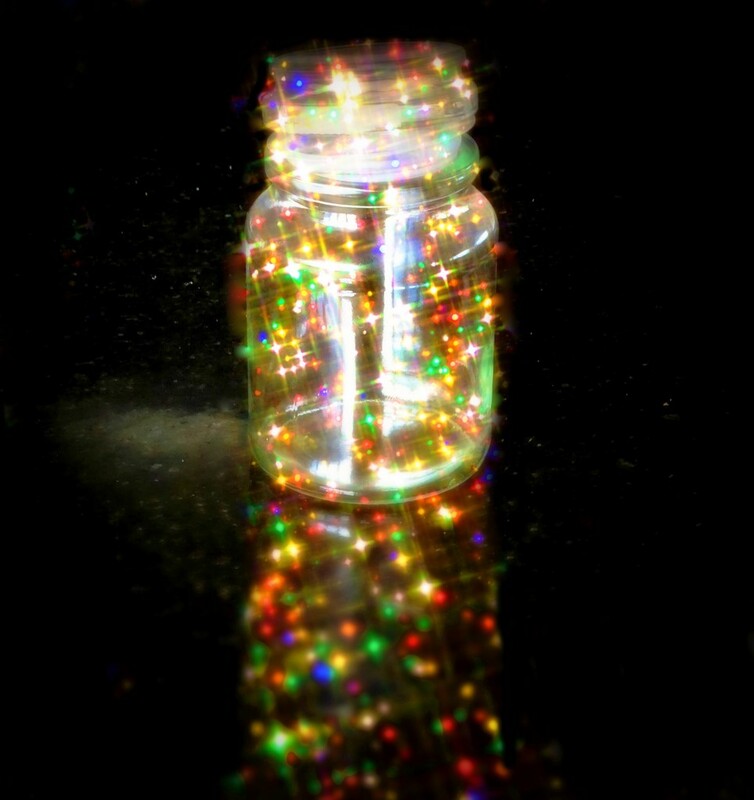 Beautiful jar of moonbeams! Now I can’t get that song out of my head! I always loved to sing it as it makes me laugh! Love that song - and your visual interpretation. Went to bed with this so g in my head. Loving your moonbeams and reflections. Enjoy your travels. have a fine time with your reunion/travels. stay away from the sour people.